The CLose-UP Imager (CLUPI), part of the instrument payload on the ExoMars rover, is a camera system designed to acquire high-resolution, colour, close-up images of outcrops, rocks, soils, drill fines and drill core samples. Located on top of the drill box, CLUPI will be angled and raised by using the degrees of freedom provided by both the rover and the drill box, so it can observe in a variety of viewing modes. The use of two fixed mirrors – one flat and one concave – will provide three fields of view (FOV). 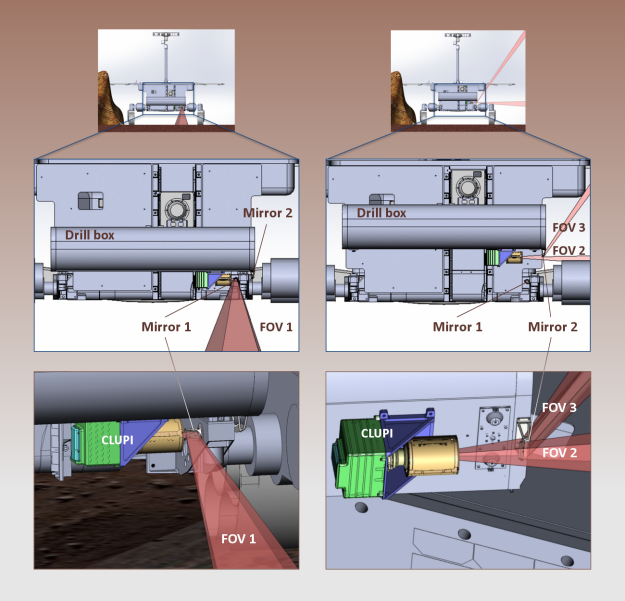 When the drill is in the stowed position, typically during a geological survey, CLUPI will observe immediately in front of the rover, using field of view 1 (FOV1). This field of view is 1768 pixels high by 2652 pixels wide. CLUPI will use one of two other fields of view (FOV2 and FOV3) for other studies, such as observations of outcrops, monitoring the drilling process, studying the borehole or imaging the material collected by the drill. FOV2 is 1128 pixels high by 2652 pixels wide, and FOV3 is 640 pixels high by 2652 pixels wide.